Compact "pie pumpkins" are the meatiest and most flavorful. 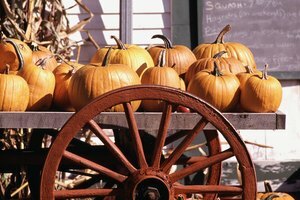 Pumpkins are as iconic a symbol of autumn as anyone could wish, as evocative as the crisp, colorful New England leaves. Most of those grown are used as decorations, either in their natural state or carved for jack-o'-lanterns. 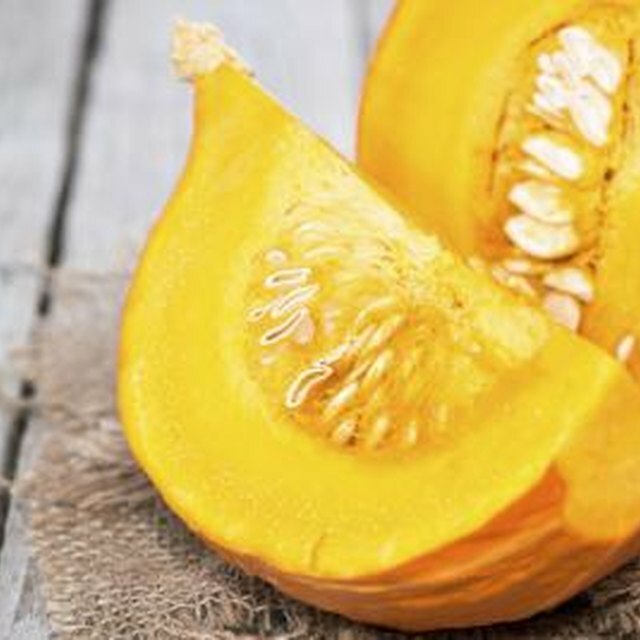 However, like other squashes, pumpkin is a versatile and nutritious vegetable in its own right. Regular pumpkins can be cooked and eaten, though "pie pumpkins" have the best flavor and texture. Dice peeled and seeded pumpkin and add it to slow-cooked dishes with richly flavored ingredients such as short ribs, venison or spicy sausage. Pumpkin cooks more quickly than potatoes or carrots, so add it near the end of cooking. Stir diced uncooked pumpkin into risotto at the beginning of the cooking time, or roasted pumpkin near the end of the cooking time. Make ravioli filled with pumpkin puree mixed with creamy peppercorn ranch dressing, and serve them with browned butter and fresh sage. For an elegant dinner for the grownups, stuff tiny pumpkins with rice and precooked ground meats, and bake them until tender. Peel, seed and dice pumpkin ahead of time and freeze it, some roasted or steamed and some uncooked. Add the uncooked pumpkin to soups and stews as they're reheating, and it will quickly absorb flavors from the broth or gravy. Small-diced pumpkin will cook quickly in a skillet with onions, greens and flavorful sausage, making an easy meal with cooked rice, potatoes or pasta. Layer your holiday leftovers in a baking dish lined with roasted pumpkin, and reheat it for an easy day-after dinner. Cut long, thin strips from one side of a pumpkin, and remove the peel. Glaze the slices with maple syrup or a mixture of brown sugar and butter, and roast them until tender. Sturdy greens such as kale and spinach go well with pumpkin. Saute them together in a pan with onions and butter or vegetable oil, a small pinch of nutmeg and a few tablespoons of bacon ranch dressing. Toss diced pumpkin with cumin and coriander to accompany Middle Eastern dishes. Simmer diced pumpkin in sweetened orange juice until the pumpkin is tender and the orange juice forms a glaze, then serve it with roasted chicken or turkey. Pumpkin makes a superior pureed soup. Simmer uncooked pumpkin in chicken or vegetable broth until tender with ginger or maple syrup, then puree it in a blender and thin with more broth if necessary. Roasted pumpkin can be used the same way, and makes a sweeter, richer soup. Arrange roasted pumpkin with strongly flavored greens such as curly endive or arugula, dried cranberries and toasted walnuts to make an autumn salad. Alternatively, combine diced roasted pumpkin with roasted beets and strongly flavored cheese, and garnish with toasted pumpkin seeds. Use a sweet, fruity vinaigrette such as pomegranate or a light creamy dressing.